The school board will hold a work session at 9 a.m. on Wednesday, December 12 for the purpose of discussing budget adjustments. The board has been working since late-September to identify ways to reduce the budget and/or increase revenue by $2.5 million. During the work session, which will be held at Central Services, board members will work to develop a final recommendation on areas of the budget to adjust. See the official meeting notice. A budget adjustment recommendation is expected to be on the Dec. 13 agenda as a Report for Information, and the board is expected to take action on a final budget adjustment list at the Dec. 20 meeting. Congrats to the St. Croix Valley Area Learning Center (ALC) for capturing the Elympics championship! 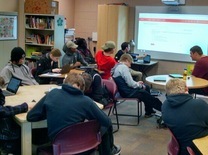 ALC students beat out teams from 34 other alternative schools throughout the state of Minnesota in the knowledge competition. More than 60 ALC students took part in the event which is hosted by the Minnesota Association of Alternative Programs (MAAP) to promote teamwork and problem solving. This is the second championship for the ALC team. 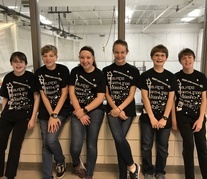 The Oak-Land Middle School Lego League Team won the Robot Performance award at the regional tournament. Team HEROS (Helping Earthlings Research Outer Space) designed and created a prototype for a vermicompost that could be used on a long term space mission to create compost, dirt and fertilizer for growing plants in space. They beat out 31 other teams. HEROS also won the award for Core Values (discovery, innovation, impact, inclusion, teamwork and fun). They move on to the section tournament in January. 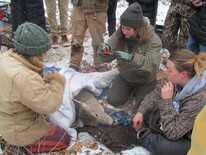 A unique opportunity for Stillwater Area High School students to work with experts from the Wildlife Science Center to trap and track urban deer in their own backyard. Read more about the program on our website. Andersen Elementary third graders are brushing up on their math skills and connecting with the community. 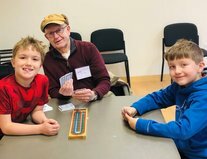 They visited the Bayport Senior Center to take on some volunteers in a game of cribbage. The students also made holiday ornaments, pictures and cards for the seniors to display. 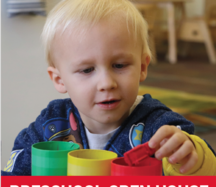 Join us for an Open House at any one of our eight preschool locations on Wednesday, Jan. 16 from 5:30-6:30 p.m. Meet the teachers, see the classrooms and find out all we have to offer our youngest learners. Preschool registration opens Jan. 17. Learn more. The district's student attendance and discipline policies have recently been updated. View the revised version of the Attendance Policy and Discipline Policy online. policy, which is required to come before the school board annually for review. The community is invited to hear about the district's progress on meeting the goals of the World's Best Workforce Plan. Join us for the conversation at 6 p.m. on Tuesday, Dec. 11 at Stillwater Middle School in the media center. You'll learn about the World's Best Workforce legislation, the goals and strategies our district is employing, and how we're doing in meeting our goals. Ever wonder would have happened if Dorothy didn’t immediately follow the celebrated yellow brick road? Stillwater Area High School theatre students take our favorite story on a delightful detour when Dorothy is sidetracked by a farmer offering an alternate route to the wizard’s front door — in the form of a mysterious map. Cameo appearances by Hansel and Gretel, Jack and Jill, a Munchkin TV reporter and more add to the hilarity of this clever parody that’s fun for all ages. Performances will be held Wednesday, Dec. 19 at 3 and 7 p.m. at Stillwater Area High School. Tickets are $5/person at the door. The school board will hold a board retreat for the purpose of orienting new members on Monday, December 17, 2018 from 3-5 p.m. at Central Services located at 1875 Greeley Street South in Stillwater. Read the official meeting notice.